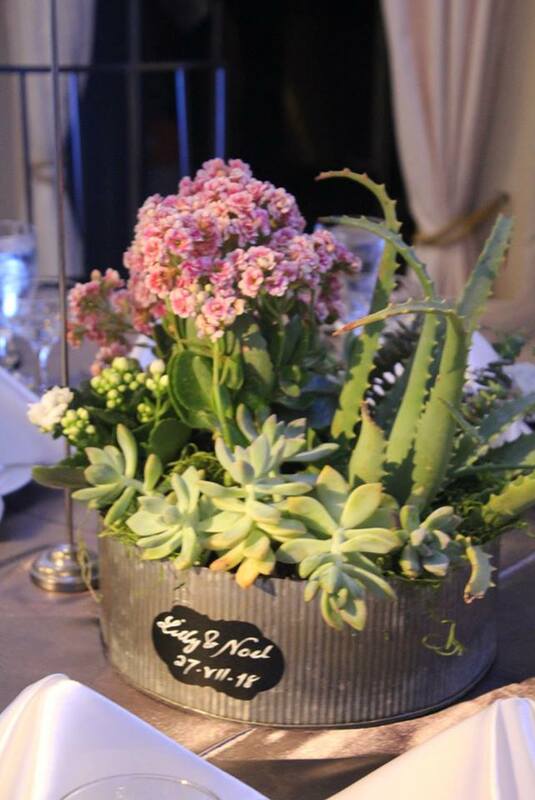 We used an assortment of succulents as the centerpiece for Lily & Noel’s wedding reception. It was like bringing the natural elements of the outdoors into the look and feel of their wedding. Charming, indeed. I take great strides doing what I do. My work is a special gift from my God. 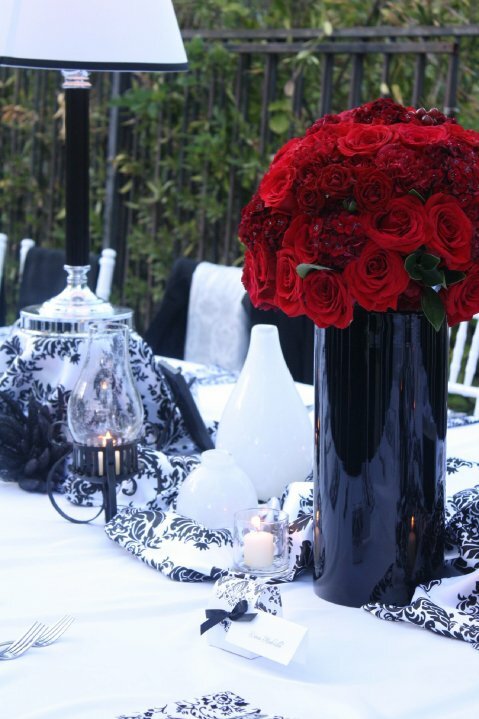 My early favorite is one I did for Bob’s birthday celebration...red floral centerpieces against a classic black and white setting and the view of the beautiful mountains of Bell Canyon. beans, wild greeneries and hunky magnolia leaves. Fitting for a place in the woods, this centerpiece sits on a vase covered with dried bark. Shh...a few sucs are trying to steal the scene. FIRST STORE. When recession hit the US in 2008, I closed my first flower retail store in Van Nuys, CA. After 3 store break-ins, over a hundred flowers and events, I moved back to my garage and then to my dining room which eventually served as my home studio. At that time my children were in their teenage years and needed my attention even more. My eldest daughter graduated from college, moved to New York to find her future and my son stepped into senior high and learned to drive. Suddenly, I woke up to the reality that I now have to step aside and found consolation from my impending nesting by doing more flowers. 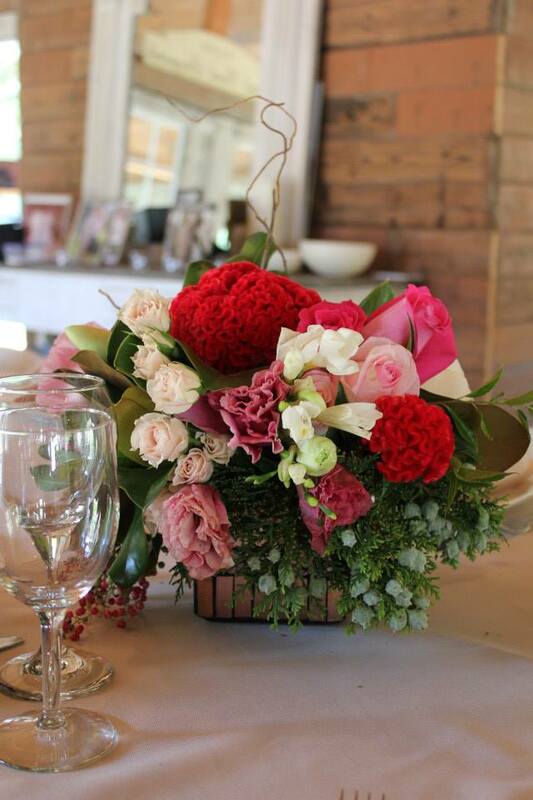 A brief stint at Holy Spirit Retreat Center eventually led me back to working full time with flowers and styling events. DREAM. Since I closed my first store, I have always wanted to open another store. At one time, I even dreamed about it - the way it looks and the elements that will be included. During one of my recent trips to New York to visit my daughter, she brought me to a store in her neighborhood in the Upper East Side. “Mom, you have to see this”, she said. The store was Plantshed. It was a flower shop and a coffee shop in one, with a big table in the middle for people to hang out, sip a cup of coffee, pick some flowers , and wait for them to be arranged. It was like the dream in my own two eyes!”. MIRACLES HAPPEN. Recently, I have been posting about miracle moments in my life in order to lead you to this one big miracle that even I could not fathom- the opening of my dream studio/ showroom/ storefront on January 8, 2019 in the boundary of Canoga and West Hills in Los Angeles, CA. Follows is a post from my FB on my birthday last January 20. “God sent angels Linda M. Crisostomo and my sister Celia Blancaflor to help me set this up. I originally planned to work in New York for a year and save money to be able to build my dream place. But it meant being away from my family and friends. Linda and I were also looking at cheap tickets to the Philippines to work on building a retreat center. I have been crying, kneeling, begging, praying for my God to give this to me...to be able to showcase and glorify Him through this special gift of floral and event design. Tuesday, January 8, 2019, the doors of the studio was blessed by Father Mao and formally opened with over a hundred of my friends ( including my best friend of 35 years Mary Tan who flew in from the Philippines) and family. 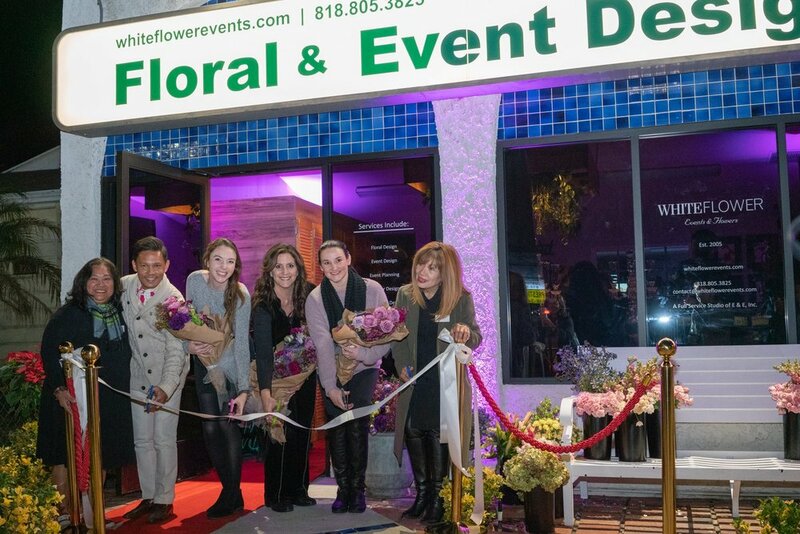 Cutting the ribbon were 3 of my beautiful brides Cassi Dobrawa, Jamie Hidalgo Armendariz, John S. Mina, Erlinda, and ace event planner Susan Armendariz who also helped paved the way to pursue my passion. What is flower art? In it's broadest meaning, flower art is the expression of creativity and/or imagination using flowers as the main inspiration. 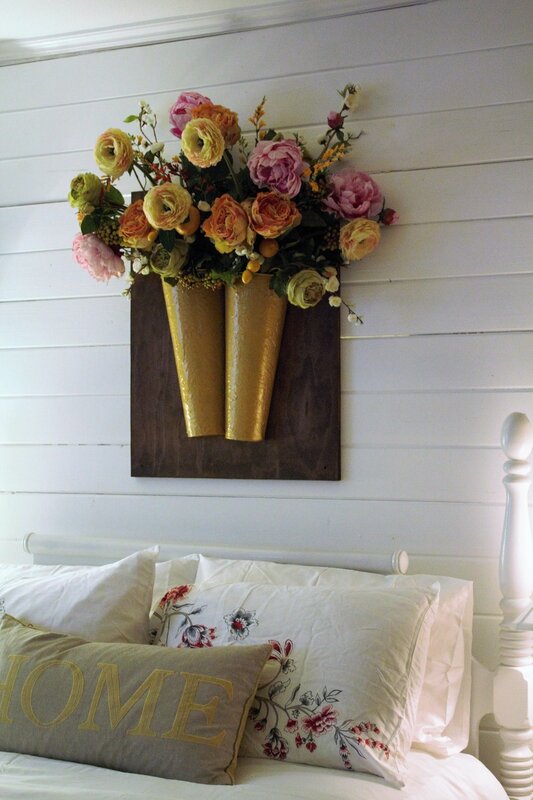 For a bedroom that I helped design a few years ago, I made a flower art using silk or imitation flowers to give the wall behind the bed a life. The silk flower art was so stunning - it was thrilling to see how close to nature it looked. There's probably nothing more breathtaking than having an event at a barn- whether it be a rehearsal party, a wedding, a birthday or an anniversary. Think rustic, bare wood tables and chairs, citronella candles, green fields and parasols, and fresh flowers that can make you feel as close to nature as possible. For Rick's rehearsal wedding party held at a remote barn in Calabasas, I used fresh sweet magnolia flowers picked from my backyard that blended well with the musky smell of the beautiful barn. To date, I still get the oohhhs and the ahhs from people whenever I show pictures of the event. When STEP’s (SUCCESS THROUGH EDUCATION PROGRAM) ace Event Planner Susan Armendariz told me that the theme of this year’s Gala Night will be Mexican and will be at the LA Police Academy’s Rock Garden, my thought was to use the bark lanterns I recently used for another outdoor event. However, after a second site visit it was decided that the event will best be at the Officers’ Lounge indoors with all the amenities. The bark lanterns would not work well indoors. Mexican tiles immediately came to my mind. I will use them as flower vases. I always loved its vibrant colors and rich historic connection. Mexico is well known for its organic and artsy tiles called Talavera. Talavera’s are made from clay out of the ground and fired to a temperature at which the clay undergoes chemical changes and becomes permanently hard. The tile is then glazed and decorated by hand with very attractive, colorful and very expressive images, and fired once again to give it a final and lively finish. Since the 1500’s, it is a rooted cultural heritage in Mexico. They have embellished many public and private spaces throughout Mexico, from kitchens, fountains, facades, to the interiors of luxurious hacienda homes, public offices and churches. However, I could not make the vases using the actual tile due to time limitations. So off I went to my favorite graphic designer Quan – and wrapped 20 circular and rectangular glasses with a collage of Talavera’s in print. Sitting on these beautiful vases were fresh huge Ecuadorian red roses, my favorite raspberry cup dahlias, and 10 boxes of greeneries with red berries to pull them all together. 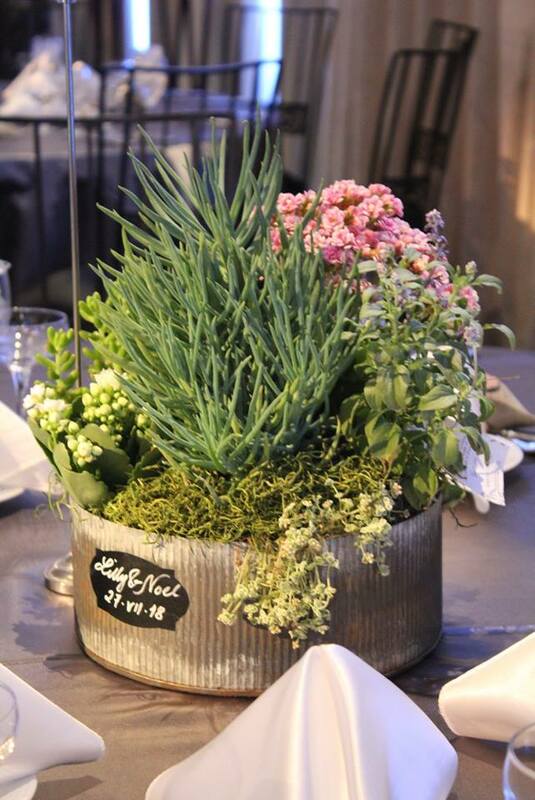 Once again, the centerpieces stood out …beautifully. Viva Mexico! TGBTG…To God be the glory. My passion in action - bringing beauty and joy in people's special and momentous occasions....how refreshing is it to see people and their reactions when walking into a world they envisioned and you created for them . For Cassie and Ralph's wedding, I drew inspiration from the humble and sweet personality of the bride and the grand location - 11,000 hectares of lemon trees and California avocados in the middle of Santa Paula, CA. The result of these very organic combination are these pictures. Thank you Mr. and Mrs. Ralph D., Cassie's mom Debbie and their ace event planner Susan Armendariz who always allows me to think of possibilities ..thank you Jesus for the gift of making beautiful happen. This one is for the memory of a lifetime.